Despite the current slowdown the Chinese car market still provides robust growth potential. According to the China Association of Automobile Manufacturers (CAAM), Chinese car production increased 7.3% year-on-year in 2014, to more than 23 million units. Passenger car sales increased 9.9% while commercial vehicle sales dropped 6.5%. According to CAAM, total car production growth slowed to 2.6% year-on-year (12.1 million units) in H1 of 2015, mainly due to lower economic growth. Passenger car sales registered an increase of 4.8% to 10.1 million units as consumers continued to flock to dealer showrooms. But the slowing economy had an impact on the commercial vehicle market, as sales of commercial vehicles decreased by 14.4%, to 1.8 million units. Given the downward revision of the forecast for Chinese GDP growth to 6.5% in 2015 and the recent stock market volatility hurting consumer spending, car sales are currently expected to grow just 3.9% this year, down from 7% growth projected in January 2015. Despite the current slowdown the Chinese car market still provides robust growth potential. Car ownership remains quite low, with about 154 million vehicles on the roads in a country with a population of 1.4 billion. That compares to less than 120 cars for every 1,000 people, far lower than in mature markets such as Europe and Japan, with penetration rates of 600 vehicles for every 1,000 people. After decreasing production and sales in 2014 the Chinese truck market is expected to show moderate growth rates in 2015, also driven by the fact that booming of e-commerce increases demand for road transportation and express service. With positive factors such as increased demand for tourist and school buses, the bus segment is expected to continue growing rapidly in 2015. 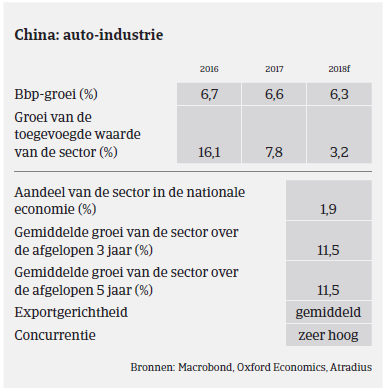 However entry barriers for auto manufacturers are high in China, as the sector is capital intensive and requires constant investment in Research & Development (R&D) to develop new models. The life cycle of new models in China is getting increasingly shorter too: for instance, while in mature markets the life cycle of a new car model is 6-8 years, in China it is 4 years. In the commercial vehicle segment competition is even fiercer, with the life cycle of a new model now as short as 6-18 months. As in 2014 payments in the Chinese automotive industry take 90 days on average, but we expect longer payment terms in the future because of liquidity pressures on suppliers. Payment defaults in the automotive sector are on a par with other Chinese industries, and automotive businesses in general will see their profitability hit by more intense competition. However, despite the expected slowdown in growth we do not expect any significant increases in payment delays or insolvencies in the coming months. Despite the downturn in the economy, our underwriting stance towards manufacturers remains open. 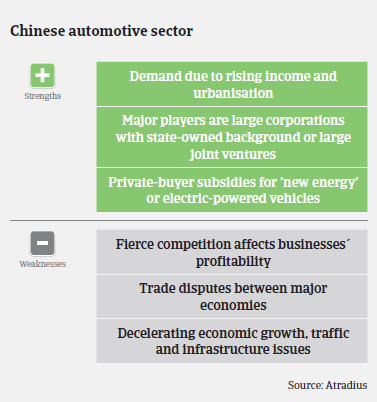 We still view auto manufacturers as strong businesses, because of the sector’s capital and technical intensity and the growth potential of the Chinese car market. However, we are more cautious towards manufacturers of domestic brands than we are to joint ventures with established foreign partners, and focus more attention on companies involved in ’new energy’ or electric-powered vehicles. In all cases, we look mainly at cash flow and profitability when considering applications for cover. Core parts manufacturers (engines and related equipment) usually have high R&D costs (often accounting for more than 65% of net profits) and therefore, when assessing their creditworthiness, we tend to focus on their own financials. For players in the non-core parts segment (lights, seats, axles, tyres etc.) we focus on whether they are overly export-oriented, in view of on-going anti-dumping policies against Chinese enterprises that can lead to import barriers. We take extra care with smaller companies in the car part supplier segment: they will come under particular pressure because of their poor equity strength, which could give rise to insolvencies. Unlike manufacturers, businesses in this segment may have difficulty obtaining bank finance. In the car dealer segment, problems have mounted since 2014, with 50% of car dealers losing money since last year as sales have started to slow. There is overcapacity in this segment as the number of car retailing businesses sharply increased during the boom years. Almost 60% of the retailers are single-site operations - often poorly capitalised. Many car dealers are now affected by decreasing sales prices, while at the same time they are often pushed by car producers to achieve aggressive sales targets in a cooling market. Therefore, when assessing the credit risk of car dealers, we consider changes in stock levels in 2013 and 2014, cash flow and the rationale for any expansion of their business.